Seventeen years ago, in the island village of Dentro, lived a large and powerful demon. With just a howl, mountains were obliterated. With the help of an outsider, the chief of Dentro destroyed the demon and sealed its dark power within three powerful ancient weapons: a spear, a shield, and a sword. After leaving the unwelcoming village, the man who had helped destroy the demon took the sword in an effort to keep the village and its people safe. Months later, a villager bore the son of the outsider. Carrying the child of a stranger was in violation of a sacred village law, and everyone knew whose child the boy was. Born into a village filled with hateful people, Zephyr grew up not knowing why he was so hated. With no friends, and eventually no family after the passing of his mother, Zephyr was forced to survive by himself as an outcast. Zephyr's only wish was to make his mother proud and force the village to recognize him--while surviving in a world filled with demons, paranormal abilities, love, hate, and undiscovered lands. 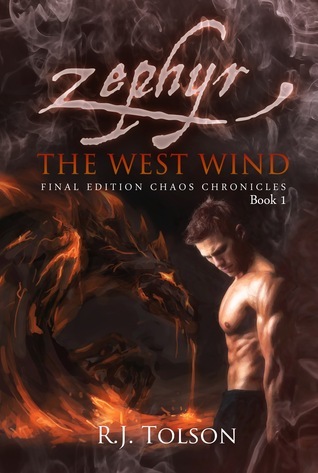 As an avid fan of the Fantasy genre, I was excited to dive into Zephyr: The West Wind. There is nothing I love more than immersing myself in a new world and meeting the characters who live there. We meet Zephyr, a boy who has been treated as an outcast since his birth. All his hopes lie in making a place for himself in the village and redeeming his family name. I liked Zephyr as a character. He was proud, strong, and unwilling to give up despite ridicule. That's why I was saddened that I wasn't given more of a chance to know him. While it was nice to see a slow unveiling of his background, I still felt less attached to him than I would have liked. R.J. Tolson populates his world with many characters. The downside is that some of them aren't as fleshed out as they could be. On the other hand, the world itself is gorgeously rendered and easy to become immersed in. Tolson has mastered the art of descriptive writing, and it is easy to conjure an image of what Zephyr and his companions see. It was easy for me to transport myself to the vivid landscapes that they wandered through. I think my favorite part of reading Zephyr: The West Wind was the opportunity to visit a new world. In terms of story line, I honestly feel it could have been slightly shorter. Fantasy books are known to be rather lengthy, but I admit that there were parts that felt very slow. Despite any issues I might have had though, I ultimately enjoyed my time spent with Zephyr: The West Wind. I see great things coming down the road from R.J. Tolson. With a little more polish, I truly believe that he has the potential to weave even more magic for his readers. A guest post by Marion Croslydon and a giveaway! Falling For You Promo Post and Giveaway!